20.5.1897: Launched by Edwards Bros, North Shields (Yd.No.551) for Kelsall Brothers & Beeching Ltd, Manchester as PIGEON. 21.6.1897: Registered at Fleetwood (FD171). 1897: Completed (John E. A. Kelsall & George Beeching, Fleetwood, managers). 8.4.1899: Registered at Hull (H155). 5.11.1911: In North Sea (Sk.C. G. Wilkins) in a strong gale and heavy sea at about 6.15pm. heard a whistle blowing. Approached and found steam trawler BASSEIN (H68) in distress. Skipper asked to stand by as he had shipped a heavy sea and was filling with water. 6.11.1911: Situation deteriorated, distress signals shown and skipper requested crew to be taken off. About 2.30am. boat launched and crew of nine taken off. Vessel listing heavily to starboard and hoping for a moderation in weather, laid by until the following morning. 7.11.1911: At about 4.30am BASSEIN foundered. 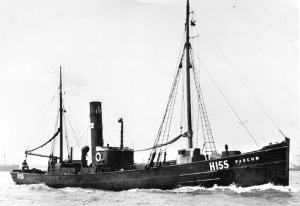 (Later Bosun F. G. Gowen and 3rd Hand F. Clayton of PIGEON awarded BoT Sea Gallantry Medal for rescue). 9.1.1912: Bosun E. Costello had finger and thumb taken ofF when hand trapped by boat painter during transfer to cutter. 2.9.1912: Re-measured after lengthening at Goole to 118.2 ft 166g 69n. 2.9.1912: Hull registry closed and vessel registered anew in consequence of material alterations (H155). 11.1914: Requisitioned for war service as a minesweeper (1-6pdr HA) (Ad.No.378). 12.1915: Renamed PIGEON II. Based The Nore. By 12.3.1919: Returned to owner at Hull. Reverted to PIGEON (H155). 7.6.1919: John Slater, London appointed manager. 1931: Sold to George Duncan, Mallaig. 1931: Sold to Star Fishing Co Ltd, London (George Duncan, Mallaig, manager). 25.10.1933: Reported alongside at Fraserbugh in sinking condition, apparently abandoned. 1933: Sold for breaking up. 31.12.1934: Hull registry closed “Broken up”. 16/01/2009: Page published. 4 updates since then. 08/09/2017: Removed FMHT watermark from image. This entry was posted in Steam Trawlers, Steamers (Picture) and tagged Kelsall Bros & Beeching Ltd on January 16, 2009 by Fred Smith.